PLATINUM Investment Group (IGP) is an experienced and well-established investment and development group developing real estate projects in Bulgaria, Romania, Serbia and Macedonia. IGP has been operating in south east Europe since 2005 and has established in that period a reputation for excellence and quality without compromise. 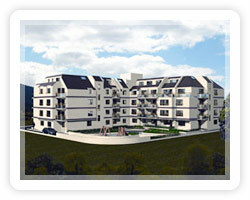 IGP focuses on medium and large scale residential and mixed-use developments. IGP�s portfolio of residential buildings and residential complexes demonstrates the Company�s abilities to deliver quality projects combining excellent design with first-class materials and workmanship. IGP relies on its experienced management team which holds vast experience in real estate development in Central-East Europe and South-East Europe. IGP truly believes that the best results are always achieved through cooperation between our international management team and our skilled regional staff and the Company puts that in practice thus achieving excellence and workmanship of the highest quality in each and every project. © 2006 - 2010 Platinum Investment Group | All Rights Reserved! All images are for reference only!